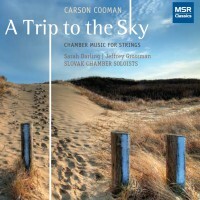 Cavatina (2008) for viola and piano is dedicated to Sarah Darling and Jeffrey Grossman. The score is also inscribed in memory of American composer Donald Erb (1927–2008). Cavatina (noun, Italian): a simple song or melody, properly one without a second part or a repeat; an air. This atmospheric work is marked “Very slow, very sad, dream-like.” The landscape is resonant and colorful, as if fragments of a distant song try to assert themselves and then vanish as wisps.